I know she loves me. Really, I do. It's just that I thought it would be different with our second. Lucy is almost two. She runs. She falls. She cries. She holds up her arms so I swoop her up for a cuddle and then it happens. She says, 'Sigi'. I don't mean to be needy. I just think that at this point something along the lines of 'Mommy' might be nice. Is it possible to be jealous of an inanimate object? 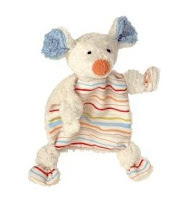 Sigi is an organic teddy bear snuggly given to her at birth by her older sister as part of the second baby process. Everyone told us to have Polly give Lucy a gift to ensure Polly still felt secure, loved and to curb any feelings of jealousy. We didn't really think about the effect this toy would have on us - jealousy? Surely not. 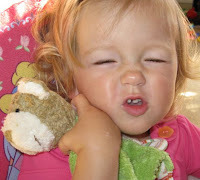 Like Polly did - and still does at the age of five - Lucy learned to fall asleep with her Sigikid toy. Sigi is her comfort, like the blankie or dolly most of us had as kids. Sigi was easy for Lucy's little hands to hold so it was one of the first things she could grasp and now that she's walking, one of the easiest things for her to carry around with her. Lucy's third word after 'Dada' then 'Mama' was 'Sigi'. And why not? He's super soft, cuddly and her constant companion. Sigikid is an innovative German toy company new to Canada but established in Europe for over 40 years. Lavish & Lime is the first Canadian e-tailer to offer Sigikid products online. 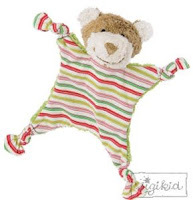 Shop our Sigikid collection of organic and other toys here.